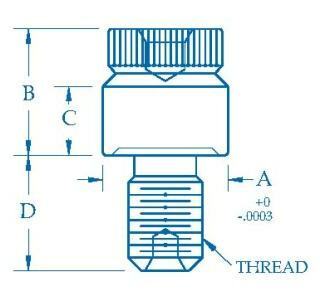 This style of Threaded Hole Centerline Location Gage is made similar to the Flexible Threaded Hole Centerline Location Gage except that it is not slit. The design intent here is that the Solid Threaded Hole Centerline Location Gage is screwed hand-tight to the part surface that is perpendicular to the thread. 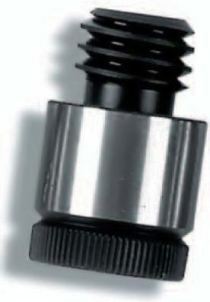 The pressure against the collar, as it is tightened, forces the Solid Threaded Hole Centerline Locator to self center against the internal thread flank angles. Yeah, it probably works, after all it is the most popular style of threaded hole locator. There are many sizes available from stock from at least two different manufacturers that make these as a primary product. The bottom side of the collar has been relieved so that only the outer most diameter contacts the surface of the part. The problem here arises if the surface is not perpendicular by design or in error. Screwing against a sloped surface may tip the locator and misposition the Threaded Hole Centerline Location Gage; which in turn will give a very repeatable false reading. A good thing is that it can be calibrated, but make sure the bottom surface of the collar is checked for wear. Call or e-mail us for a quote on anyone of the above styles.